We were recently approached by a couple who owned their own home in Harrow, North London, and also had a buy-to-let property in nearby Milton Keynes. 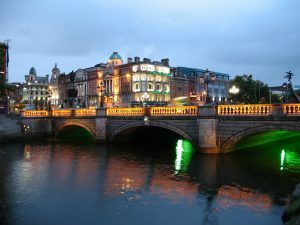 They were in the process of planning a move to Dublin, Ireland where one of their parents had lived their whole lives, and indeed where he was born. Their property in Harrow had an outstanding mortgage of £127k, whilst the buy-to-let property was £111k. Following many visits abroad they finally located a property on the outskirts of Dublin city, but conveniently close to their family with a market value of €237k (£210k). Having found the property they were now in a difficult position, as the high street lenders they had approached were not willing to offer a remortgage – or any other form of additional finance arrangements – on either property without the mortgage arrears they had accumulated over the last year being cleared in full. With firm offers on either property, they feared due to the fast moving Irish property market, that they would lose out on the property and its commutable to the city centre location, which was perfect for the new employment positions they had secured. Following a recommendation from a friend who had needed auction finance in the past they contacted One 77’s Specialist Lending Department for a solution. Taking into account all the details we ascertained that a bridging loan was required to allow them to buy the house in Dublin, whilst the Harrow and Milton Keynes properties continued to be marketed for sale. Following contact with a specialist lender we were able to arrange a second charge regulated bridging loan on the Harrow property, with a 70% LTV (loan-to-value), thereby giving them the full £210k they needed to purchase the Dublin property mortgage free. The bridging loan was arranged fee free and the lenders costs were rolled up into the loan (added on to the final payment). In order to move swiftly on the arrangement of the loan and to fit within the time frame the clients desired we also dealt with all consent issues from their UK based bank on the finance agreement. We were also able to recommend an international currency brokerage that was able to assist with the property purchase in Ireland and movement of the couples funds to a Irish bank. All these factors accelerated the process for the clients and they were able to move abroad shortly after. To discuss your individual situation and find out how we can help with your specialist and bridging finance needs, call our Specialist Lending Department on 01249 474956. Alternatively book a call by using the contact form below.